Camping not your thing? You prefer pavement to earth, a roof to the starlit sky, four walls to a thin tent between you and all those things out there going bump in the night? Those might all sound like valid reasons to not want to go camping—but only if you’ve never done it before! Camping is a fantastic opportunity to bond with your family, relax away from the pressures of modern life, and just get back into a natural rhythm with the earth. 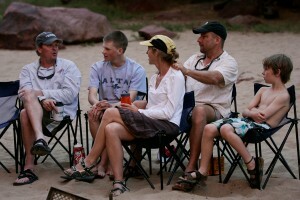 Better yet, camping during a river rafting trip is a huge part of the fun and adventure. We’re here to tell you camping is actually a pretty cool thing to do. Need more convincing? 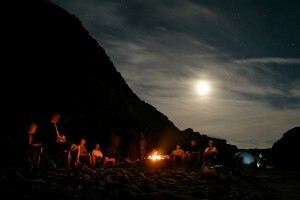 Take a look at our Top Five Reasons to Go Camping if you never have before. We’re betting on making a believer out of you. 1) Spend quality time with your loved ones. As if rafting down a scenic Western river wasn’t enough fun already, getting to then camp out with your family for several days is a great added bonus. 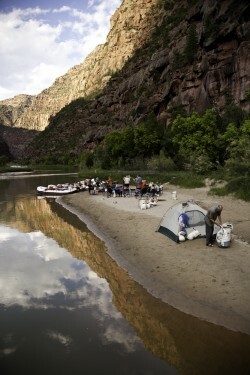 Camped on a white sand beach by a river flowing through a beautiful canyon means no modern distractions: no TV, no cell phones, no electronic games, no ceaseless texting by your teens (or you). This means bonding the old-fashioned way by talking, laughing, playing together, and getting to perhaps have some more in-depth conversations with your family members than you ever have before. 2) Admire nature up close in all its amazing glory. Living in cities, many people are separated from nature by concrete, glass, vehicles. When you camp out on a river trip, you get the chance to appreciate the deep blue sky, the fresh clean river, the air that is likely more pure than what you breathe back home, and all the little miracles that are so easy to take for granted, like a perfect desert flower or a smooth, round river rock that fits perfectly into your hand. One of the biggest and best surprises for people on an overnight river rafting adventure is the night sky, which is often full of more stars than you’ve ever seen before in a light-congested city. 3) No need to keep up with the Joneses. You can get dirty, your kids can get dirty, you can have holes in your clothes and no makeup on your face, and guess what? It’s all good! No one will judge you! Hair can be mussed up, your shirt can be wrinkled, and no one knows what kind of car you drive. Camping is about freeing yourself from the societally-created boxes we sometimes live in when in cities, and letting yourself really be who you are. And when that who you are starts to smile and laugh a lot despite have a dirt smudge on your leg and a good case of hat-hair, you know you’ve waved bye-bye to those silly Joneses and are just having the time of your life on your camping trip. 4) Realize how little you actually need. 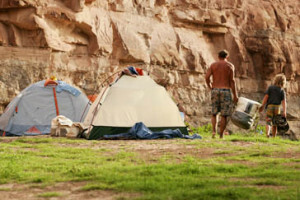 Camping boils down to the basics: shelter, warmth, food, water, companionship. And really, how much more than that do we honestly need in life? You will find you can survive and thrive without many of the amenities at home we often think we “must” have, and you’ll barely miss them after a while. On a Holiday river camping trip, we actually offer up more luxe conditions than most people expect, which goes to show that camping doesn’t have to be about “roughing it.” The fun irony is that when you do get home, you’ll appreciate electricity, modern technology, flush toilets, etc., all that much more! 5) Relax, relax, and relax. 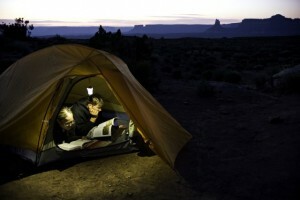 Sure, there are considerations that might be new to you: how to sleep comfortably in a sleeping bag and how to go to the bathroom in the great outdoors tend to be high on the list. But after your guides teach you all the tricks and you ease into the slower pace of life on a river camping trip, everything is much more calm than back home. No phones ringing, dishwashers to be loaded, parent-teacher meetings to schedule, job stresses to deal with, traffic to be negotiated. It’s just you and the deep, peaceful energy of the wilderness…and with nothing to do but enjoy yourself and loosen up a little, you’ll probably soon find camping one of the most relaxing activities you’ve participated in.